The free VHDX viewer tool can open any type of virtual disk image files from a corrupt or failed drive. As soon as the VHD/VHDX file is imported to the tool, a scanning process begins. This repairs the disk image file and recovers any recently lost or deleted data. The VHDX file reader allows in-depth analysis on the disk image file. It displays all contents for preview including VM operating system boot files. It displays the complete details of a virtual machine without any changes. 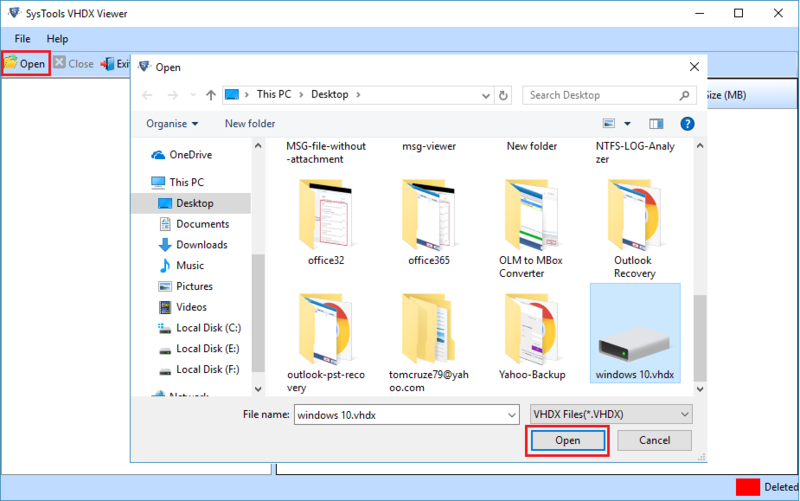 The VHDX file viewer has an option to recover any recently lost or deleted items. After the scan, the tool displays the deleted items in a separate space to choose and recover items. Deleted data is only recovered from VM operating system files and not backup files. All boot files and root folders are available for preview instantly with their file attributes. Open and read data from a corrupted, damaged, or formatted disk image. Each folder is displayed in tree-view structure on the left panel of the software. Data items are shown in the center. The VHDX reader software is capable of opening and displaying contents from both FAT 32 and NTFS type of VHDX file. The tool also supports both fixed disk and dynamic disk types. 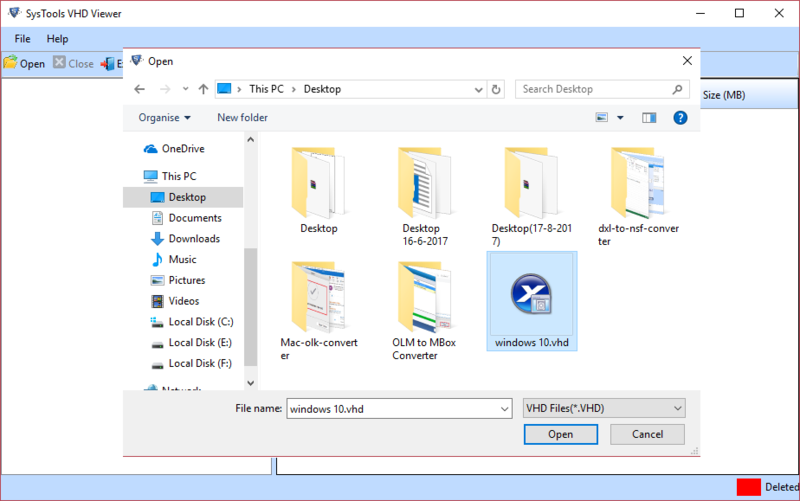 The VHDX explorer utility can display contents from virtual machine VHD or VHDX files. 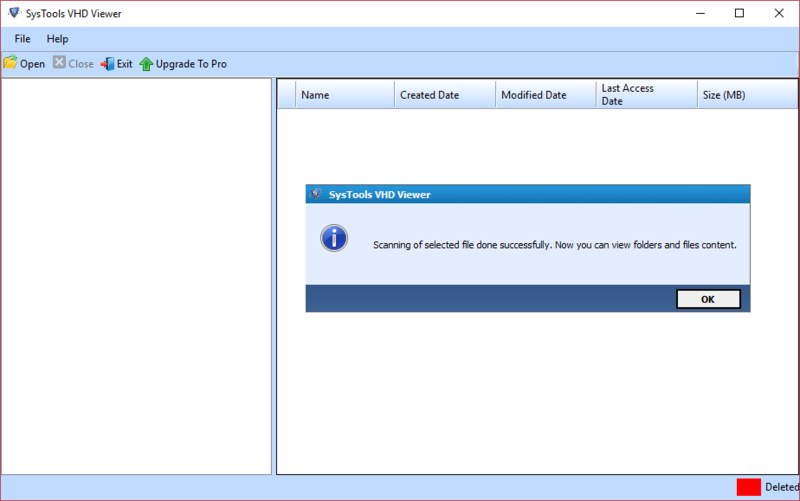 Analyse data from a disk image from any virtual machine including the hypervisor (or Hyper-V) server from Microsoft. 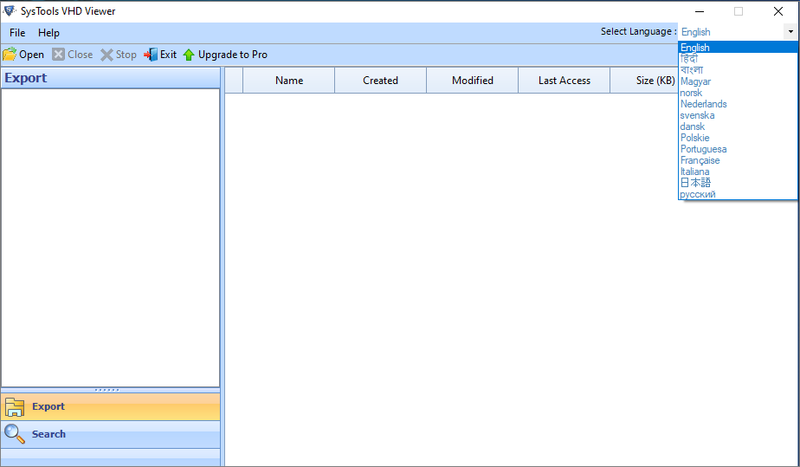 The VHDX Viewer is compatible with all versions of Hyper-V server. The tool has a simple interface that can be used even by a non-technical user. The VHDX file reader software can open and read a virtual disk image on any Windows operating systems. This includes Windows 10, 7, XP, 8, 8.1, Vista and all below versions. It makes it easier to read virtual machine information without mounting the disk using third-party tools. The VHDX file viewer can read disk images from a single or partitioned virtual machine. There are no file size limitations implemented on how large the image file can be. It is a simple and easy-to-use tool. It has a super user-friendly interface that can even be used by a non-technical user. The VHDX reader has a unique ability to save a snapshot of the disk image file. When a VHDX file is uploaded to the tool, an instance is saved for the next time. This will save time from uploading and scanning the file again. Simply, click on the snapshot to preview items. 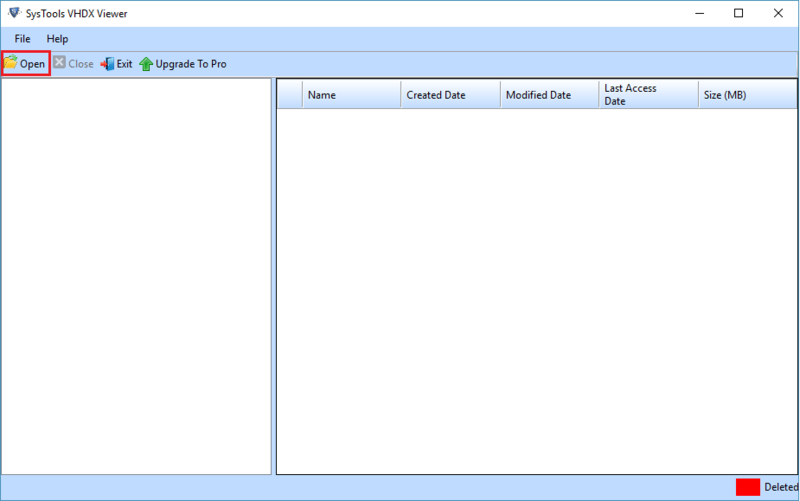 There are no changes made to the data being displayed using the free VHDX viewer application. Open, read and preview boot files from a disk image. Analyse the state of the Windows operating system VM and recover data from a corrupted or damaged machine. How to Open VHDX File in Free VHDX Reader? Is there an option to search files within the VM disk image file? No, the VHDX explorer tool is only meant for previewing contents. Can the software be used to recover data from a backup VHDX file? No, the VHDX browser tool can only open VHDX file of a virtual machine, not a backup file. Could the utility save a recovered photo to the Windows desktop? No, the free VHDX viewer tool can only preview the recovered items and not extract it to the desktop. Is there an option to save a healthy VM disk image file from the tool? No, the VHDX browser tool can only display corrupt data from a failed machine. Upgrade to Pro version to save a healthy copy of VHDX file. Can the upload more than one disk image and preview them simultaneously? The VHDX explorer tool can browse VHDX files one at a time. There is no option for bulk image preview. Can this tool work with my Windows Server 2008 operating system? Yes, the VHDX reader tool is compatible with both Windows server 2008 and 2012 versions as well as with 10, 8.1, 8, 7 and all other versions. "This is an amazing tool! I just installed in on my Windows server 2008 machine and it worked wonders. I was able to open VHDX file and open to read its contents easily. Also, there was some corruption in the Windows 10 virtual machine which was immediately discovered by the tool. Kudos to the development team to come up with such a great solution." "Our system administrators were working with the new VHDX format to save disk image the Hyper-V server. The virtual machine got corrupted and all data was lost. It was then, that we came across this amazing free VHDX Viewer. It did the trick and allowed us to preview all the items. Now, we have successfully recovered our data. Thanx!" The free VHD viewer tool is capable of opening all types of the virtual disk image files, which are corrupted or failed. Just after browsing VHD file in the software, file scanning procedure begins. This will be repairing disk image file and thus, extracts lost or permanently deleted items from VHD. The VHD file reader enables users to perform deep analysis of the disk image file. It will be displaying entire contents for previewing items that include boot files of VM operating system. Tool will be showing all information of the virtual machine without any manipulation. 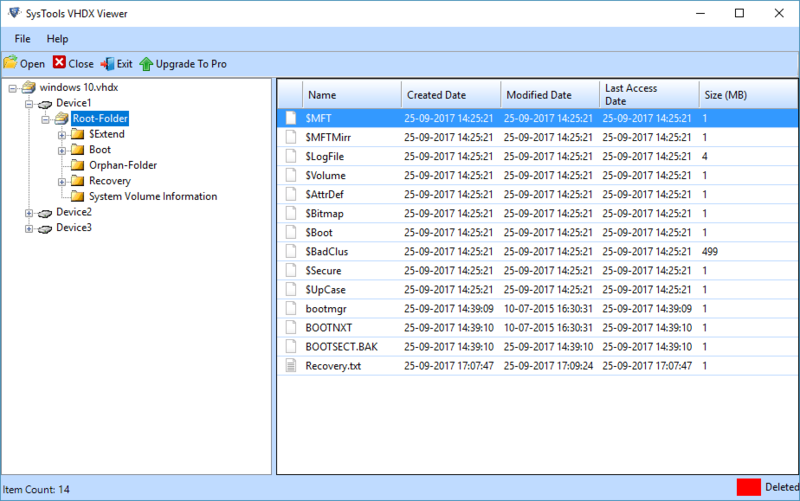 The VHD file viewer provides an ultimate feature of recovering permanently lost items from browsed file. When scanning gets finished, it will be displaying all the recovered shift deleted items in a separate manner. The lost items are only retrieved from files of virtual machine and not the backup files. 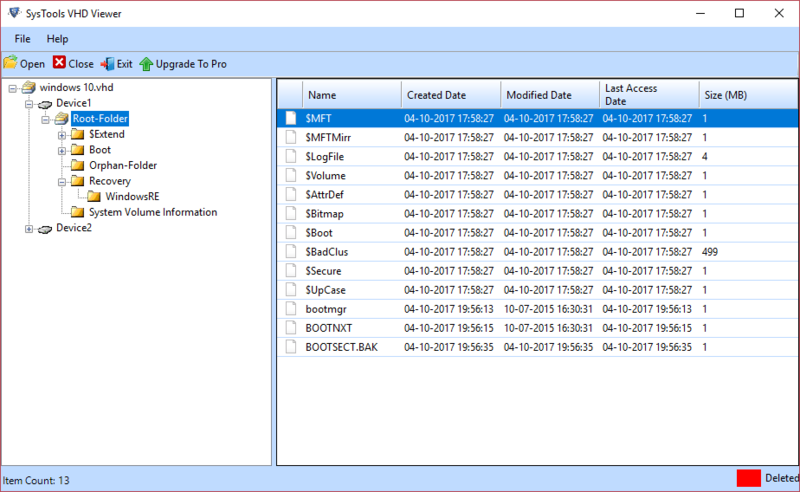 With help of this VHD viewer freeware, users will be able to view root folders and boot files with their respective attributes. One can explore contents from corrupted, damaged, and formatted VHD files. All the folders of the file will be listed on left-hand side of the tool, which is in a tree-view format. The VHD reader utility exhibits feature of opening and showing data from FAT32 and NTFS .vhd files. It supports both fixed as well as dynamic disk types and works with them in a smooth manner. The freeware supports VHD as well as VHDX files for the actual working purpose. The software analysis content from the disk image file of virtual machine, which includes hypervisor server provided by Microsoft. The VHD viewer is easily compatible with all editions of the Hyper-V server. There are no high technical skills required to work with this free utility. VHD file reader product is capable of opening and reading virtual disk image on all versions of Windows OS. This can be any like Win 10, 8.1, 8, 7, and all the prior versions. Now, it will be easy and simple to read files of virtual machine without mounting the disk via third-party products. VHD file viewer is capable of reading drive images from single as well as multiple partitioned virtual systems. There will be no file size restriction while browsing VHD file in this tool. The software is totally free from all limitations and is designed in a way that it can be utilized even by a non-technical person. VHD reader is having an ultimate feature of saving a snapshot for the drive image file. Whenever a VHD file is browsed in the software, a sample gets saved for the future use. This facility will be helping a person in saving time at the of uploading file once again. Just click on snapshot for previewing the same data again. There will be no manipulation made in the existing data of browsed files. With help of this VHD viewer program, users will be able to open, view, and read boot files of a disk image. The freeware will smoothly extract items from corrupted as well as damaged machine without any hassle. Does your software provides any advance searching feature within it? No, the VHD explorer software is meant only for previewing contents. Is it possible to recover items from a backup VHD file? No, the VHD viewer freeware supports .vhd file of virtual machine only. At a time, can I browse multiple VHD files in this VHD file reader? No, the VHD file explorer supports browsing of only one file at a time. My VM is displaying a black screen and I have to view some core items. Will your freeware help me? Yes definitely, you just have to extract VHD file from your virtual machine and browse it in this freeware. Will your software work on Microsoft Windows 7 operating system? Yes, VHD file explorer is compatible with all versions of MS Windows without any complications. "Since last 3 to 4 days, I was facing trouble in mounting and opening VHD file on my Windows 10 machine. The reason behind occurrence of this issue was sudden failure in the virtual machine, which made my .vhd file inaccessible. But, with help of this VHD file reader, it was possible for me to view contents of VHD file in a hassle-free manner. Thank You!" "Whenever I was trying to access my VHD file it was displaying an error i.e., ‘failed to open C:\vhddir\MyVHD.vhd’. During these hassled days, my manager suggested me to use this VHD viewer freeware. I took his words and downloaded the setup file of the product. Surprisingly, the free utility offers an excellent measure to explore contents of VHD file."